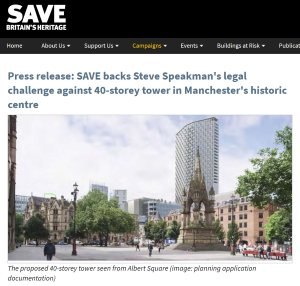 SAVE Britain’s Heritage welcomes the bid by Steve Speakman, chairman of Manchester Civic Society, to challenge the highly controversial planning permission for a 40-storey tower in Manchester city centre. The grounds for a challenge are likely to go before a judge in September who will consider whether to grant permission for a judicial review of the council’s decision. If permission to proceed is granted, the judicial review is likely to be heard within the next six months. The action comes after £6,000 was successfully raised through crowdfunding from supporters across the country to bring the legal proceedings to this stage. View more information on Manchester Civic Society and see The Guardian for more on skyscraper developments around the UK .